Andrew and Dane Rawlins have been asked to perform a dressage lecture demonstration for HORSE magazine. The exciting event will be held at Unex Towerlands in Essex on Friday 25th April. HORSE magazine are hosting the event to help raise funds for the charity, the International League for the Protection of Horses. Others performing at the exclusive event include William and Pippa Funnell and Oliver Townend. The best of the evenings advice will appear in future issues of Horse, so even if you can& rsquo;t make it to Unex Towerlands, you'll still be able to read all about what happened on the evening in HORSE magazine. 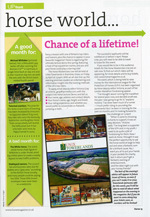 Baileys Horse Feeds, Andrew's sponsors are running a competition in the next issue of British Dressage magazine. You could spend two days with Andrew and Dane Rawlins at their yards in Surrey. The two day experience is exclusive through Baileys Horse Feeds and British Dressage magazine. So don't miss the next issue to find out how you could win this amazing prize!